The new Z300 may be lacking the outright peak power its A2 category rivals such as KTM’s Duke 390 (43bhp) and Yamaha’s YZF-R3 (44bhp), but it’s the first bike in this class to genuinely look and feel like a slightly smaller version of its bigger cc brothers, even up close. It’s got all the road presence, build quality, style and kudos of a full-fat supernaked – just with enough performance to ensure your A2 licence survives intact long enough to mature into a full one. 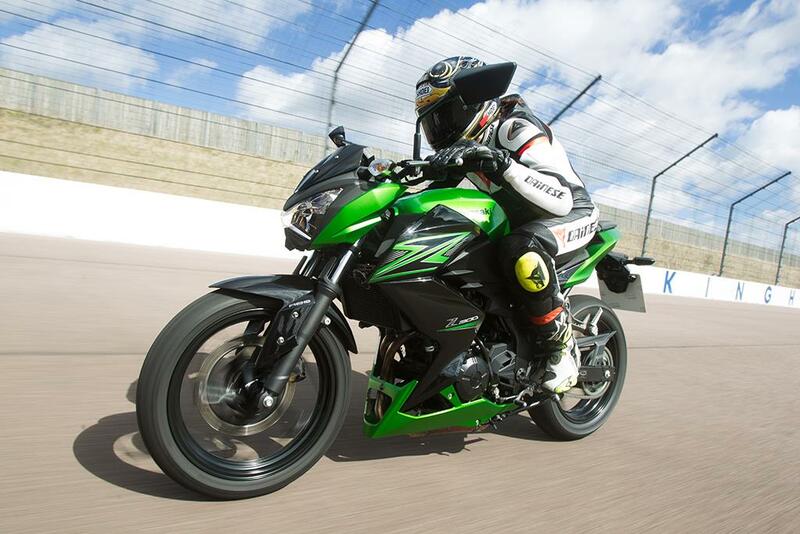 Trust Kawasaki to bring a slice of supernaked nuttiness to the A2-licence class. Forget dull traditional-style commuters, or scaled-down race reps, now there’s a credible, funky looking roadster for riders who aren’t licensed for, or perhaps don’t want to ride, larger capacity machines. The Z300 is the great pretender; convincing supernaked looks and stance contained within a capable and easy-to-use chassis. What the motor lacks in bottom-end it makes up for with that trademark Kawasaki high-revving character. The Z300’s riding position is excellent; those proper supernaked-style flat bars are at just the right pitch to lever out loads of fun, while the pegs are high enough to not pose any ground clearance problems, yet still comfortable enough to not reduce your knees to two painful packets of broken biscuits after a long ride. The 300’s broad tank, made even broader by its power-dressing, shoulder-pad style side fairings, makes for decent lower-body wind protection when cruising at motorway speeds (which it’s easily capable of if you are), but does give the bike a slightly pendulous, top-heavy feel at a standstill. Taking up just 2kg of the 170kg overall wet weight, the Z300’s ABS system is the lightest ever fitted to a motorcycle, and is well worth having for the peace of mind it brings. The power and feel offered from the basic single-pot front caliper is adequate enough for everyday use, and the fork reacts to hard braking surprisingly well, while still offering decent damping over Britain’s potholed back lanes. The Z300 floats down A and B-roads with all the poise and road-holding of a larger machine; remaining agile without suffering any of the flightiness or feelings of vulnerability experienced with typical lightweight machines. Yet it’s a sensation that evaporates with the turn of the key. The 296cc parallel twin is super smooth and beautifully balanced, and the Z300’s steel frame insulates any engine vibration via its rubberised mounts. In fact, the baby Zed’s chassis and suspension work really well together. The ride quality is decent and the Zed’s stability at speed is really impressive, in spite of its spindly fork. An unkind person might say that the twin-cylinder motor doesn’t deliver power in such a way that would ever trouble a decent frame, as the Z300’s low rpm drive is distinctly lacking. But the eager little twin more than makes up for it with the sheer ability to rev its crackers off at the top end, meaning it’s both docile and easy to manage for the daily commute, as well as being a high-revving hoot for Sunday B-road blasts. 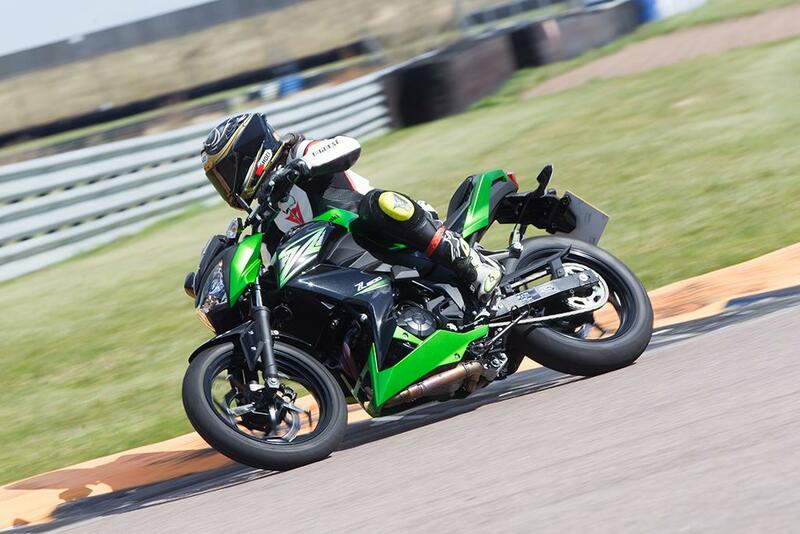 Kawasaki have managed to give their entry-level Zed the same engine character as the flagship ZX-10R; loads of revs, a top-end rush and excellent over-rev qualities. 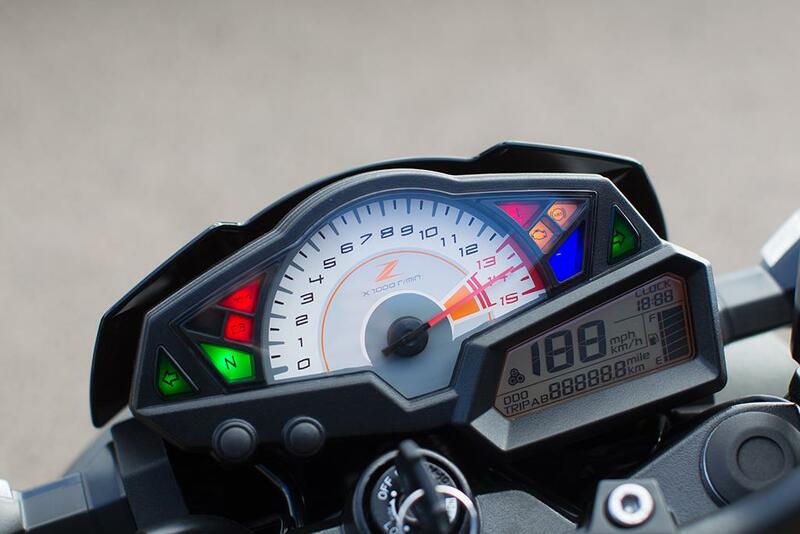 The Z300 makes its 38bhp peak at 11,000rpm but manages to maintain that power all the way to its 13,000rpm red line, meaning you can hold on to gears longer without clattering into a rev limiter. Likewise, its super-smooth throttle response and softer bottom-end power mean it won’t perturb those riders who are just looking for a mild-mannered, good looking street bike to potter around town on, either. It even has bungee hooks for added practicality, and will return 70mpg when ridden sensibly – the ‘Eco’ symbol on the LCD dash letting you know when you’re doing so. 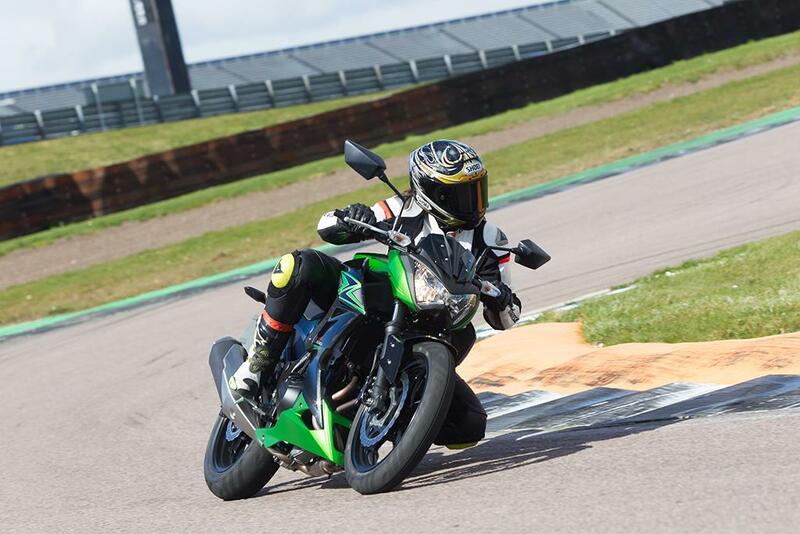 Despite its smaller size, fewer cylinders and reduced price, the Z3 doesn’t feel scrawny or cheap like many other manufacturers’ entry-level machines often do; there’s a real big-bike feel to the Z300. The Z300 is a quality offering, but built with economy in mind. If you're looking for affordable motorcycling – this is it. There's not much in the way of bells and whistles, but the Z300's got everything it needs to delvier a great ride. 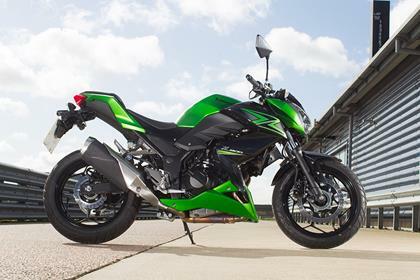 The other 300 in Kawasaki's stable is the Ninja 300, a faired version of the Z300. 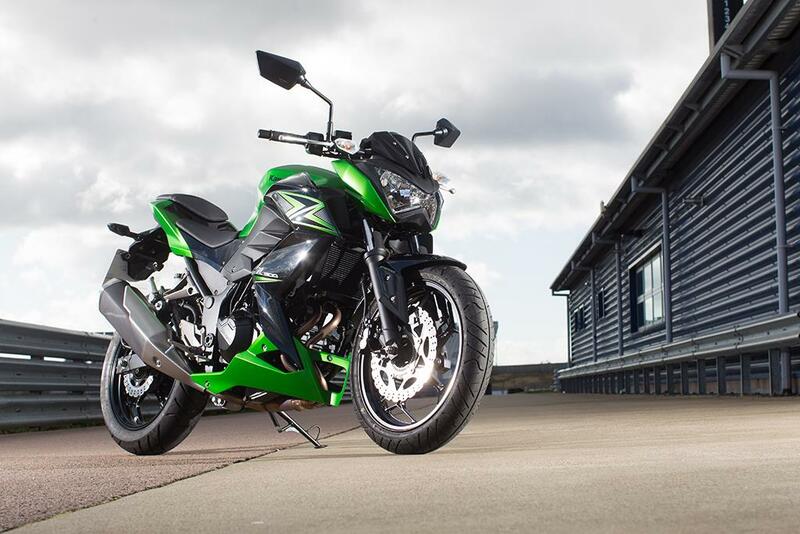 2 owners have reviewed their KAWASAKI Z300 (2015-on) and rated it in a number of areas. Read what they have to say and what they like and dislike about the bike below. Light and comfy with great mpg. Great for the daily commute in and out of London. The mirrors tell you everything behind you BUT are at an annoying height they like to clash with car mirrors when filtering, bar end mirrors can fix that. The clutch lever is non adjustable and does not bite until the very end, adjustable levers can fix that. No gear indicator, a plug and play aftermarket gear indicator can fix that. So a few little niggles that can be fixed with a few quid. Single pot brake at the front does the job and bites well. It wont have the super braking power of high performance machine, but you will not need that. ABS does a great job, and a MUST if you are a commuter! Likes to be revved. Not going to win any races, but that is not what this bike is for. Amazing build quality for a lower CC model. Smaller CC bikes usually have the cheap feel, but this has a highly polished finished. Not a lot of official accessories. After market Ninja 300 products will fit the Z300 (same bike different skin). Superb Machine Great Reving And Tourque-Great Looks And A Good Fun Ride -Lots Of Smiles. ABS Is Excellent A Great Safety Feature. Great All Rounder - Over 100Mph If Required. Good Except I Would Have Preffered A Gear Indicator. Your chance to win a Kawasaki Z300!